As extraordinary changes sweep our national landscape, I’m hearing from many of you with urgent questions about what’s happening, what might happen next, and what role we as funders can play. The SCG team and I are working hard to be the leadership hub where our sector can come together to understand what this fast-changing political climate means for the causes to which you are dedicated. From health care and immigration policy to climate change and education, from human and civil rights to protecting journalistic integrity, our philanthropic community is poised to shape California’s future—and demonstrate new ways to tackle federal policy challenges. SCG is here to help you stay informed and engaged in this tumultuous policy environment, including information below about our analysis of the state budget. You’ll also see us weaving policy topics into our 2017 programming, as more of you are exploring and expanding investments in advocacy and community mobilization strategies as part of your portfolios. In particular, our Public Policy Conference on April 6 and our Annual Conference on September 26 will be crucial opportunities for funders of all stripes seeking to stay ahead on these fast-moving issues. Please mark your calendars for both dates, and continue reading below for more detail on major upcoming events and recent milestones in the SCG community. SCG Public Policy Conference on April 6: Register Now! Right now, as dramatically shifting public policy is shaping our grantmaking landscape, it’s more important than ever for us to engage in dialogue—with each other and with government leaders. Please register now for SCG’s 2017 Public Policy Conference on April 6. We will come together for frank peer conversations about our sector's role in civil society today, as well as how strategies such as advocacy and civic engagement can protect and strengthen our communities. At this year's event, we are partnering with the California Budget and Policy Center to deepen the SCG community’s growing focus on advancing equity through public policy. 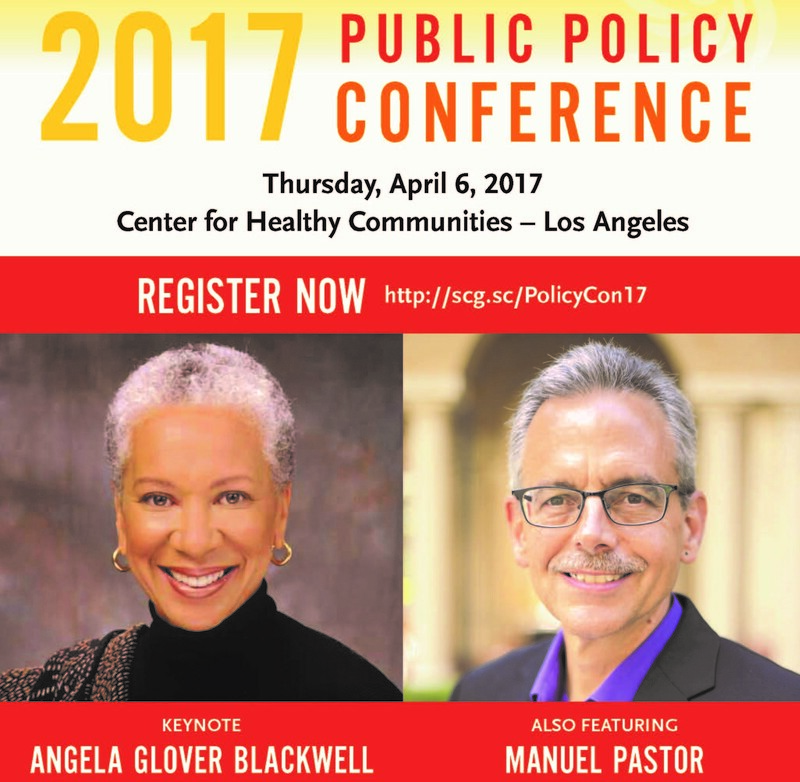 We are thrilled to be joined byAngela Glover Blackwell, Founder and CEO of PolicyLink, who will deliver the keynote address. We'll also be joined by Dr. Manuel Pastor, Director of the Program for Environmental and Regional Equity at USC. On the 25th anniversary of the Los Angeles civil unrest, Dr. Pastor will lead a session on the future of our region using the recently released report Roots|Raíces: Latino Engagement, Place Identities, and Shared Futures in South Los Angeles. Together we'll explore the dramatic positive changes that have taken place, the emergence of best practices in Black-Brown coalitions, and how we can learn from these successes to support communities across Southern California. In the coming years, philanthropy will have an important part to play in supporting polices, advocacy efforts, and equity initiatives that support our most vulnerable populations. We hope you can join us for this day of candid conversations with your peers. Special thanks to our Presenting Sponsor Bank of America, and our other early conference sponsors: Archstone Foundation, The California Wellness Foundation, Conrad N. Hilton Foundation, and Union Bank. Contact us for sponsorship opportunities! Earlier this month, Governor Jerry Brown released his proposed budget for the 2017-2018 year. With a projected shortfall of $1.6 billion, the Governor has proposed cuts to early childhood education by delaying the implementation of nearly 3,000 preschool slots, elimination of the Middle Class Scholarship (affecting nearly 27,000 students attending universities in Southern California), and elimination of a $400 million set-aside for affordable housing proposed last year. SCG has provided a high-level summary of the proposed budget here. SCG's Public Policy team will continue to track updates to the state budget and on other policy issues for members. Additionally, as a special membership update, you will also soon be able to sign up for in-depth updates from our policy team and the member-led Public Policy Committee - more details to come! To learn more, save the date for our next California Policy Forum webcast on 3/1 to explore uncertainties for funders around the 2017 California State Budget. And, as noted above, we are partnering with the California Budget and Policy Center for a special session on the state budget at our upcoming policy conference. With racial, ethnic, religious, and political divisiveness rising across America, organizations across the country, prompted by an effort by the W.K. Kellogg Foundation, called for a National Day of Racial Healing on Tuesday, January 17. Following this powerful launch, we can all help to lead this initiative forward in the days and months ahead. Building off of recent conversations at our Annual Conference and other programs, SCG is proud to support this effort and we invite members to participate in whatever ways you choose in the days and months ahead. Click here for actions you can take right now to help heal divisions in Southern California. 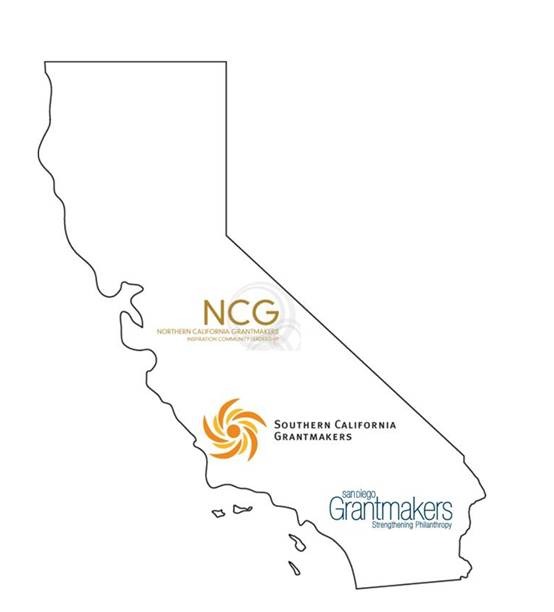 Our state’s three philanthropy regional associations—Northern California Grantmakers (NCG), San Diego Grantmakers (SDG), and Southern California Grantmakers (SCG)—are delighted to officially announce our joint initiative, Philanthropy California. Together, we are collaborating more closely to establish a stronger statewide philanthropic presence that bridges geographic and organizational boundaries and diverse interests among funders; a united voice for public policy issues affecting philanthropy; improved opportunities for learning and collaboration; the ability to engage a broader range of stakeholders; and streamlined support for nonprofits and philanthropy. For more on Philanthropy CA, visit the SCG website. We are pleased to announce the creation of Southern California Latinos in Philanthropy! SCG has launched this network with the support of Hispanics In Philanthropy and other stakeholders with an interest in Southern California. Over the past several months, we formed an ad-hoc advisory committee that includes SCG Board members Beatriz Solis (The California Endowment), James Alva (Citibank), Antonio Manning (JP Morgan Chase), Belen Vargas (Weingart Foundation), and Jonathan Lorenzo Yorba (The Community Foundation) as well as other local leaders and representatives of the national Hispanics In Philanthropy affinity group. There is a great need for Latinos in our region’s philanthropic sector to have more opportunities to come together, and the advisory committee has begun to craft a vision for Southern California Latinos in Philanthropy that will serve as a platform for this community to collaborate and amplify their voice. At SCG we are committed and excited about this work and we look forward to increasing awareness and opportunities for local Latinos in philanthropy to network, connect, and learn from each other in their respective careers. Please contact Kameron Green if you are interested in joining the group. Stay tuned for more updates! Webcast Recording Available: What Happens if the ACA is Repealed? This month, health care funders gathered for a deeper dive on what can be expected if the Affordable Care Act is repealed. We explored what repeal would mean for the safety net, community clinics and hospitals, and the Medicaid Waiver. State and local health care leaders also shared what they're hearing on the ground, and how health providers and philanthropy can prepare for a potential repeal. Together we considered many challenging questions facing grantmakers, including how a potential repeal could impact future funding strategies, if core operating support grants will be needed, and the potential for more funding for financial stability models. The team at SCG is keeping track of changes as they happen, and we will continue to inform members as new information becomes available. For resources from this program or to access the webcast recording, click here (members only). SCG and Exponent Philanthropy members convened for Exponent’s Local Engagement Group in LA to explore collaboration approaches for smaller funders. Funders learned about the current state of education in the Inland Empire by exploring new education data, challenges facing local initiatives, and examples of innovative models. SCG members examined the 2017 investment landscape and their foundations' investment strategies at Angeles Investment Advisors’ 2017 Foundation Symposium. Funders in LA and Orange County had the opportunity to join an advanced training on nonprofit capacity building through our partnership with Grantmakers for Effective Organizations. SCG, NCG, and SDG members are invited to participate in the Smart Growth California 2017 Statewide Funder Convening in San Diego 2/8 - 2/10 at a special discounted rate. The Education Funders Group and SCG invite you to join a lunch discussion on 2/8 to identify education topics to explore as part of planning for our 2017 programming. Join SCG and the Center for Strategic Public-Private Partnerships on 2/15 to explore home visiting programs at the next meeting of the LA County Child Welfare Funders Collaborative. RSVP now for a funder conversation on 2/10 with national, regional, and local leaders to consider the LGBT landscape in 2017. On 2/28, hear from the Natural Resources Defense Council and other leaders about how the new administration's policies might impact the environment in Southern California. SCG members get a special discounted rate to attend the San Diego Grantmakers Annual Conference on 3/2. Don’t forget to RSVP now for the Policy Conference on 4/6 and save the date for the Annual Conference on 9/26! Thank you for your dedication to our communities in Southern California and beyond. If you'd like more updates about our sector, read my recent post on The Cost of Collaboration in The NonProfit Times and visit our Regional Philanthropy News page.